In this exhaustively researched show by actor, director, and performer Adam G. Gertsacov, Henry Hudson comes to life in a thrilling re-telling of his adventures on the high seas. The show imagines Hudson having just returned from his fateful third voyage and giving a presentation to “investors” (the audience) about his fourth voyage to continue his quest for the Northwest Passage to China. Through the course of the show, audience members will have the opportunity to “join” his crew, learn a sea shanty, learn how to navigate using state of the art sixteenth century instruments, and hear his thrilling tale of landing in the New World and visiting this strange new island named Manna-Hatta. 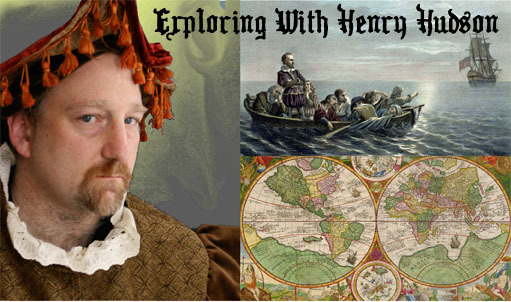 At the end of the performance, audience members are encouraged to ask Henry any questions they like about his rich and varied life as a sea captain, explorer, navigator, and Elizabethan gentleman. Hudson lived during the age of Shakespeare, Francis Bacon, Galileo, El Greco, and Queen Elizabeth. This 40 minute educational performance is suitable for all ages, and is available for extensive touring during the Henry Hudson Quadricentennial (Summer 2009). To book a performance or to find out more about the show, email hh@henryhudson.info or call 646-402-5725.